Exciting times ahead – we leave for our 6 week American adventure in 18 DAYS!!! WHAT?! That’s happened really quickly… Anyway, because we’re missing Christmas at home this year, a number of Christmas traditions, such as gingerbread men, have needed to be moved forward. Other traditions, like my husband’s repeated viewings of Chevy Chase’s National Lampoon’s Christmas Vacation, I’m not pushing quite as hard for an early start on. 1. Combine the flour, ginger and baking soda in a bowl and set aside. 2. In a large bowl, beat the butter and sugar with an electric mixer for 4 – 5 minutes, until pale and creamy. Add in the golden syrup and/or maple syrup and honey, as well as the vanilla, and beat for another 30 seconds, until combined. 3. Add in the dry ingredients, and beat on low speed until a dough comes together. Don’t worry if it is crumbly, you’ll be able to bring it together with your hands. 4. Roll the dough out to your desired thickness between two pieces of non-stick baking paper and put it in the fridge for half an hour. 5. Pre-heat the oven to 160°C and line 2 large oven trays with baking paper. 6. 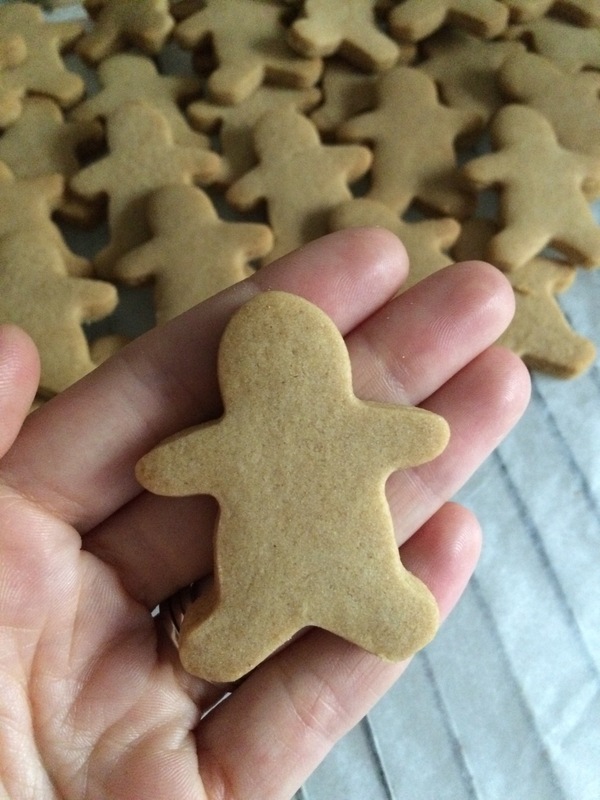 Take the cold dough out of the fridge and cut out gingerbread men of your preferred size. 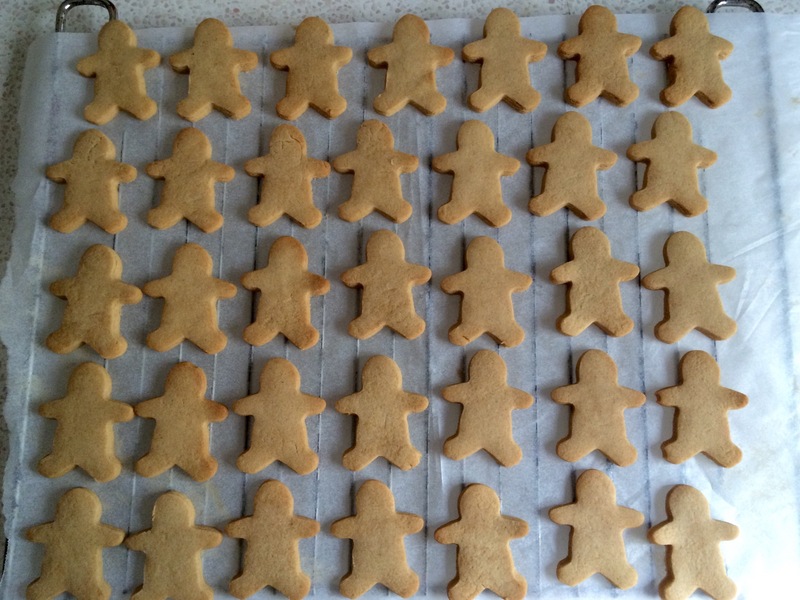 You can see from the photo below that I made quite little ones – for your reference, I got 90 (yes, 90) little gingerbread gentlemen out of the dough made from the ingredients above. Re-roll the dough as necessary until it’s all been cut and placed onto the oven trays. 7. Bake for 7 – 10 minutes until lightly golden. 8. For a softer cookie, remove from the oven and let the cookies cool on the trays for 10 minutes before moving to cooling racks. If you like them a little crunchier, turn the oven off and leave them in there to cool completely. Gingerbread Men look delicious, a great Christmas tradition too. Enjoy your white Christmas, I’m leaving for a similar trip this week, finished all the Christmas shopping and also feeling festive a little early like you. You’ve got great taste in biscuits and travel destinations, have a fantastic trip! San Francisco, New York, Toronto & Vancouver, we’ll be on a similar path, ready for another winter? Ohh no way, that’s crazy!! Yup, all stocked up on coats, gloves and thermals! You ready?! Me too! Absolutely they would – I’ve found with other biscuits that I’ve done gluten free also work well half GF flour, half almond meal too – can’t see why these should be any different! Let me know how it goes if you try!